We are looking forward to meeting our next young ambassadors in Bucharest! We would thus like you to fill in the following form until April, 17. However, we encourage international participants to apply until April, 6 out of transportation and visa arrangements concerns. Young Ambassadors Forum does NOT include any participation fee. Accommodation will be provided at Arcca Vitan Student Dorms – in triple rooms, at a cost of 9 euros/night. All the costs related to the transportation to and from Bucharest, Romania, as well as visa arrangements and meals, are the responsibility of the participant. 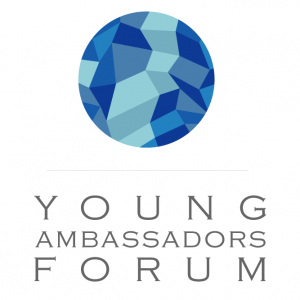 When is Young Ambassadors Forum going to take place? The project’s date is at the end of May, close to and during the European elections, May 20-25. Where will Young Ambassadors Forum take place? Should I take part in all the activities of the project? The participation in all sessions is compulsory. Which is age limit for applying to Young Ambassadors Forum? In order to qualify as a prospective YAF participant, you need to be between 18-25. How am I supposed to reach my accommodation from the Otopeni Airport? We will provide all the accepted participants with a guide containing all the logistical details in due course. For special cases, the organizers could also be also present at the airport. Are there any grants/scholarship I can apply to in order to finance my trip from my country of origin to Romania? Unfortunately, YAF does not grant any scholarship. How will my participation be recognized? All YAF participants will receive at the end of the forum a certificate of participation recognized by Voluntari pentru Idei și Proiecte Romania and the The Ministry of Foreign Affairs. How much do I need to pay for YAF? YAF is a tuition-free project. However, you should cover for your transportation to and from Bucharest, Romania to your home-country, accommodation and meals. The private student dorms Arcca Vitan, in triple rooms, at the cost of 9 EUROS. We kindly ask you to pay your accommodation in cash in the first day of the project. Will there be any social events? We are preparing for you a diversity of both academic and leisure activities, so stay tuned. How am I supposed to explore Bucharest? As previously stated, we will provide you with a guide containing all these details. How much money will I spend in Bucharest? Apart from the accommodation costs, you should not be spending more than 70-80 EUROS on food and different visits in Bucharest. Whom should I contact in case I still have questions related to my application/prospective participation at YAF?